For other uses, see Britannia (disambiguation). Britannia is a former mutual building society which merged with The Co-operative Banking Group in 2009. It is now a trading name of the Co-operative Bank in the United Kingdom. Britannia was headquartered in Leek, Staffordshire, and was the second largest building society in the UK based on total assets of £36.8 billion at 31 December 2007. It became an important provider of both mortgages (including subprime mortgages through its Platform Home Loans subsidiary) and savings, as well as commercial lending. Britannia was legally dissolved as a separate organisation on 1 August 2009 and merged into Co-operative Financial Services, to become a trading name of The Co-operative Bank. In January 2013, the Co-operative announced that the brand would be phased out by the end of 2013, and began rebranding branches under the Co-operative Bank name. However, the Co-operative Bank's own financial crisis resulted in the original plans being abandoned. Instead many Britannia branches were closed, and only a small number were retained and rebranded. A branch of the former Britannia Building Society in Peterborough, Cambridgeshire. Britannia traces its history back to 1856, when the Leek and Moorlands Permanent Benefit Building Society was formed. By 1857, the Society had 204 members and by 1921, it had assets in excess of £1m. The Society evolved into today's Britannia through a series of mergers, firstly with Longton Mutual Permanent Benefit Building Society in 1938 and notably with the NALGO Building Society in 1960—by which time it had become one of the ten largest societies, the Westbourne Park in 1965 (leading to a change of name to Leek and Westbourne) and with the Eastern Counties (as Leek, Westbourne and Eastern Counties) in 1974. A further merger in 1975 with the Oldbury Britannia Building Society saw the change of name to Britannia. Britannia also includes the engagements of the former Colne and District Permanent Benefit (1977), Westbury and District Permanent (1977), The Glantawe Permanent (1978), Stoke-on-Trent Permanent (1980), Alfreton (1981), Wellington (Somerset) and District (1981), Denton (1981), Over Darwen (1981), Driffield (1982), Colne (1983), Welsh Economic (1984), Blackheath (1986) and Mornington (1991) building societies. 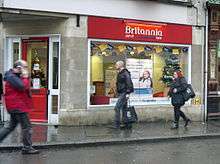 A branch of the Britannia in Gloucester displaying Co-operative branding. The most recent acquisition was the deposit base and branch network of former building society Bristol & West (bringing with it approximately 700,000 customers) from Bank of Ireland in May 2005. This was the first major re-mutualisation in the United Kingdom (following the earlier demutualisation trend) and brought membership of the enlarged society to just under three million. Bank of Ireland retained ownership of the Bristol & West brand and all other parts of the business. On 21 January 2009 Co-operative Financial Services (later The Co-operative Banking Group) and Britannia Building Society proposed a merger, first mooted in October 2008. On 29 April 2009 Britannia members voted overwhelmingly to become part of Co-operative Financial Services, the first such merger between different types of mutual under the so-called Butterfill Act. CFS, which incorporated the Co-operative Bank and Co-operative Insurance Society, was itself a subsidiary of the Co-operative Group, the largest consumer co-operative in the world. On 1 August 2009 Britannia Building Society was legally dissolved and Neville Richardson, its last Chief Executive, became Chief Executive of the enlarged CFS. Coincidentally, the competitor and largest remaining building society, Nationwide, was itself formed in 1884 as the Co-operative Permanent Building Society to provide services to members of the co-operative movement. Britsafe Insurance Services (Guernsey) Ltd.
A former member of the Building Societies Association and the Council of Mortgage Lenders, Britannia also subscribes to the Financial Ombudsman Service. In 1999, Britannia was one of seven building societies unsuccessfully targeted by so-called carpetbagger Michael Hardern. To fight this threat to its mutual status, in 1998, the Society announced that new members would in future be required to assign any future windfall payments to the Britannia Building Society Foundation, a charity set up for this purpose. On the merger with Co-operative Financial Services, members of the former Britannia Building Society became members of the Co-operative Group. The membership reward scheme was replaced with the Co-operative Membership scheme on 31 December 2009, when members began to earn dividend based on their account holding and borrowing with Britannia. Britannia were official sponsors of Stoke City F.C. who play in the Premier League and lend their name to the stadium. They also sponsor Ipswich Town F.C. 's west stand at Portman Road, the Britannia Stand which has been re-named the Co-Operative Stand. Britannia also maintains trade union affinity partnerships with UNISON—the Public Service Union (successor to NALGO), the Union of Shop, Distributive and Allied Workers (USDAW), the Association of Teachers and Lecturers (ATL) and Unity (formerly CATU). ↑ "Branch updates". The Co-operative Bank. Retrieved 8 September 2014. ↑ "Britannia in Co-op merger talks". BBC News. 12 October 2008. Retrieved 30 December 2015. ↑ "Britannia/Co-op merger date set". BBC News. 29 April 2009. Retrieved 30 December 2015. ↑ "Britannia faces £3m ballot bill". BBC News. 22 April 1999. Retrieved 30 December 2015.